We are well-known Gear Couplings manufacturer and supplier. 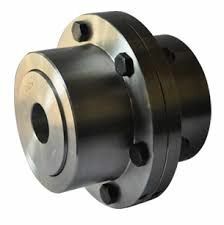 We offer Full and Half Gear Couplings, which all are unmatched example of modern engineering. Under the misalignment condition of two shafts of the equipment, the teeth contact in case of straight cut hub will be as minimum-as shown. Under heavy loads the ends of the hub teeth will get damaged resulting in the excessive play between hub and sleeve, and, therefore, the reduction in life of coupling. The triple crowned teeth hub is manufactured on a fully automatic hobbing machine with built in crowning attachment which is controlled by hydraulic and electronic systems. Under the misalignment condition of two shafts on the equipment, due to the curvature of teeth flank the contact area is much more and therefore, there is increase in life of coupling. In case of straight tooth gear coupling the maximum allowable angular misalignment is 1.1/2 deg. And in case of Delson triple crowned tooth gear coupling the misalignment is 7.1/2 degree.